The Wave has already shown improvement, but how far can they go? Tomorrow night, Mike Dunleavy's rebooted Green Wave will open AAC play in front of a national television audience in Philadelphia. When the Wave hits the court on ESPN 2 to face the Temple Owls -- one of the league's strongest teams with a very credible path to the Big Dance this year -- they'll boast a 9-3 non-conference record. Coming off a 6-24 campaign in 2016-2017 with three conference wins, anyone watching Tulane can tell you the improvement this season has already been clear. With conference play on the horizon, the new question is: how far can this team go, and how quickly? If you're waking up for hoops as we near the end of College Football's bowl season (cough, Banks was in), here's quick breakdown on how things have gone to date. Tulane has built to a 9-3 record while feasting on lesser competition (and they did feast, including a 27 point beatdown of Colorado State from the Mountain West in Jamaica and scoring 80+ in 6 of those 12 matchups). FTW is a big fan of the Ken Pomeroy ranking system, and Ken Pom's numbers have the Wave rising a solid step above preseason projections up to #153 as of today. RPI isn't a perfect metric of course, but this is a noteworthy improvement to say Tulane is coming into league play with a Top 100 mark when you look at where the team has finished recently. Well, if you go back to the AAC Preseason Poll in October, Tulane was picked to finish above only the dreadful ECU and USF programs -- teams that have fired and just hired coaches respectively. I think it's safe to say that Tulane has legitimate upside well beyond 10th place, but how high? A 7-11 year would be a tangible improvement from last year's 3-15 campaign; however, I think this team has the potential to steal some more games on this list -- that January 9th trip to Memphis looks pretty good to me. Overall, the league picture has been strong with ESPN projecting four AAC teams to make the Dance in their latest update. 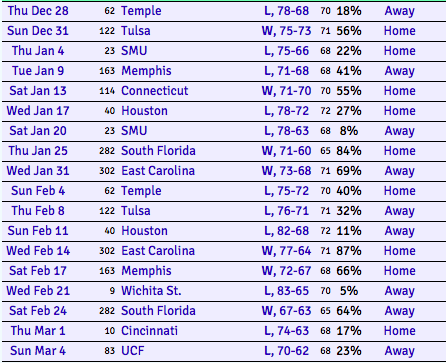 As of now, those would be frontrunner Wichita State (2), Cincy (6), SMU (10), and Temple (11). UConn appears to have claimed the mantle as the most disappointing team to date, with an 0-4 record against Top 100 teams and a recent 25 point drubbing at the hands of Auburn. UCF remains intriguing, as they sit outside the bubble and have work to do but have captured five straight starting with a road win over Alabama. Memphis has been downright weird, as the Tigers have flirted with disaster just about every chance that has been presented to them. That includes a home double OT win over Mercer, a 1-point win over Samford, and a 4-point comeback win over Siena. What's Working for the Wave? Our hoops correspondent Sam Vancini went on a tweet storm this week (we've taught him well), so I'll share his analysis here since it's pretty good. Aside from his Offensive Rating being outstanding, he's just been plain good while averaging 10.8 points per game with 6.3 rebounds and shooting 55% from the floor. UNLV transfer Jordan Cornish has also been thrust into a leadership role after returning home, just a hair back with 9.9 points per game. He showed a lot of poise when stepping up against Nicholls State, as the Wave struggled to put the Colonels away. Cornish's 18 points were a driving force in the comeback. Big reason they're shooting so well: ball. movement. Dunleavy's emphasis on ball movement has paid dividends. Cam Reynolds has looked lethal in the corner, and it has shown in his numbers. He's at a career best 44.9% from the floor and 43.9% from three point land (a solid step from 38.8% last year). With Reynolds already establishing himself as a top tier player in this league, the explosion of former 4-star recruit Melvin Frazier has been huge. In fact, it has produced the #2 scoring tandem in the American Conference with 33.3 points per game for those two. Frazier was named the Louisiana Player of the Month in November for his efforts, and the Wave will need him to continue his production to shock some folks in league play. 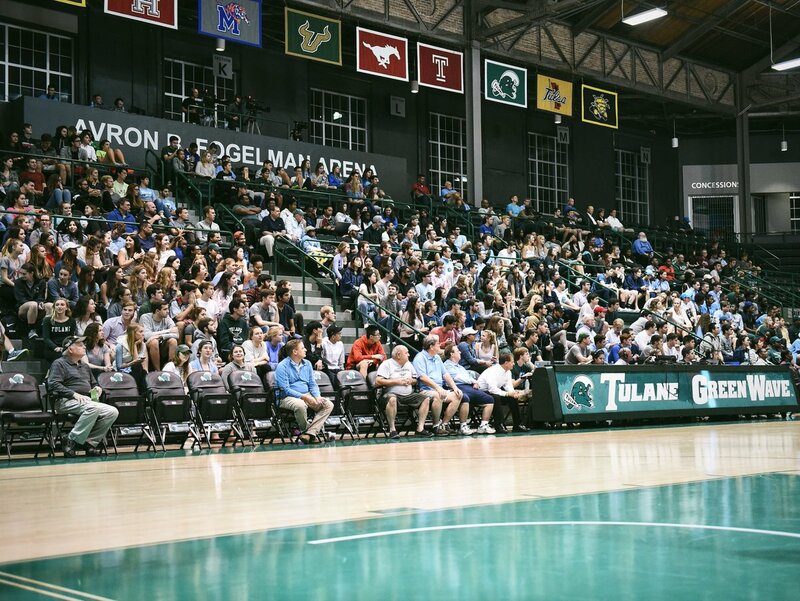 This Tulane team has already beat its mark from last year and looks to exceed expectations in its second season under Coach Dunleavy. There's certainly opportunity to make this story even better, and it will likely rest on the team's ability to show discipline, move the ball, and get its stars to produce in league play. It will start tomorrow against a quality Temple program. Roll Wave.